Kathleen McDermott is a Brooklyn-based new media artist working with custom, DIY wearable electronics. Her creations probe the limits of what is possible in the realm of hardware design and creation, engaging with the physical world through sensors, robotic appendages, scent creation, sound projection and fog. Her line of playful wearable electronics, Urban Armor, has been featured in a range of major publications, including The Wall Street Journal, Huffington Post, Dezeen, and Fast Company. Her work has been exhibited internationally, including at Ars Electronica in Austria, Currents New Media Festival in New Mexico, The Wende Museum in Los Angeles and The Museum of Arts and Design in New York City. Through her artistic practice, McDermott seeks to expand the scope of accessibility of future technology design; she actively seeks opportunities to facilitate workshops and skill shares, and she creates tutorials for prototyping with DIY electronics online at https://urbanarmor.org/. Please tell us a bit more about yourself, your background and how you became interested in world of technology and fashion in particular. I have a background in fine art, specifically sculpture. After graduating, I worked in fabrication, helping to produce artworks for other artists and props and for theather and film. That work set me up to be a really good problem-solver, because it’s all about realizing someone’s vision on a tight budget and timeline. I started using DIY electronics while pursuing my MFA and it became an instant addiction. I really love the process of moving from the idea-phase of a wearable, to actually seeing the thing function in 3-D space, because there are always qualities you don’t expect. I like wearables in particular because the lines are blurred between industry, art and life. Fashion can be a way to construct identity, it can be a way to perform and be playful, and it can also be practical. I like pushing the playful and performative side of wearable tech because I think it’s an under explored area. What is the concept behind Urban Armour and how did you come up with it? The short answer is that Urban Armor is a series of playful wearable electronics designed to investigate the relationship between technology and bodies in public spaces. The longer answer is that I think art can be a place where ideas are presented, explored and challenged, and I try to do this in real time through designing and producing absurd wearable electronics as part of an artistic practice. I’m specifically interested in using absurdity in tech design, because it’s the opposite of how we usually think of technology, which is generally associated with logic. 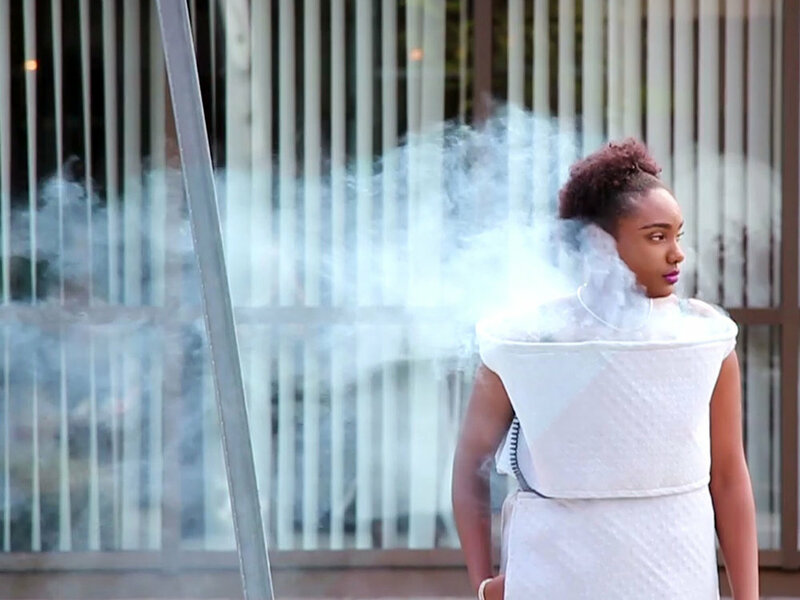 I’m particularly interested in intervening in physical space – I’ve made a dress that produces a cloud of fog and a skirt that opens when someone comes too close to it– because a lot of our narratives of the future are disproportionately focused on virtual bodies and bodies represented by data. I think there’s a lot of anxiety surrounding the future of physical bodies, and how we will incorporate technology into them. The pieces and accompanying videos I produce are an effort to probe that space and open up conversation around it. When did it all start and do you have other members in your team? I have been working on this project since the Fall of 2013. I began it while completing my MFA at The School of Creative Media in Hong Kong. As an artist, it is mainly my project, but I try to open it up in various ways. I host tutorials for the pieces at https://urbanarmor.org/. And the process of filming the pieces always becomes a collaboration, I usually work with friends to wear the pieces and to help me film. I frequently give talks and workshops and am always interested in discussing collaborations, or hearing about other people’s work. Feel free to reach out to me through my website! How long was the process to be where you are now? It’s been about 6 years since I started doing this type of work and I’m always trying to learn more. In that time, I’ve come a long way in my electronic fabrication knowledge. The pieces have tended to increase in complexity, though that doesn’t always mean they are more “successful,” in an artistic sense. There a lot of pieces I’ve made that I don’t end up fully documenting or showing because I don’t feel they are successful. But I learn a lot of technical things from every piece I make. I learned most of what I know by reading tutorials and manuals and then physically trying things out. One of the reasons why I make tutorials is because I want to contribute to a community of knowledge that’s been so helpful to me. The learning curve was an obstacle at first. I handled it by gradually increasing the polish and complexity of the pieces. So the first version of The AutoFilter (a scarf that moves to block the wearer’s face automatically in response to pollution), was just on a breadboard. Then I soldered it to a blank PCB. Later, I started laying out circuits and etching them myself. More recently, I’ve been using Eagle to design 2-sided boards and sending them out to get produced professionally. If I had tried to do that from the beginning though, I don’t think I ever would have made the first piece, because it would have been too overwhelming to learn everything at once. Everything I’ve designed and made could definitely be improved upon, but I think it’s important to try to push something out with whatever skills you have, even if its not perfect, because you will have different ideas and conversations about it once it exists in physical space. One of my earlier pieces, The Personal Space Dress, received a lot of press attention and that was a really interesting experience. I was invited to wear it on Good Morning America but I was in Hong Kong at that time and couldn’t go. Most recently it’s been featured on the British television show QI. The press attention was maybe more of a chance happening than an achievement, but it opened up a way for me to have broader conversations about the work I’m doing, and to see the way people respond to it. I’m working toward finishing a PhD in Electronic Arts at Rensselaer Polytechnic Institute (RPI), I think I will feel really accomplished when that is complete, I’m currently ABD. And last year I was invited to serve as an artist-in-residence at the Museum of Arts and Design (MAD) in NYC. Again, that was cool because I had the chance to talk to so many visitors about the ideas behind my work. As artists, we need those opportunities to get out of our heads. I like going to industry events for the same reason. What are some of the challenges of being an entrepreneur in the niche you are in? Are there any specific to being a female artist/designer in your space? I don’t think of myself as an entrepreneur so I don’t know how well I can speak to that. But I will say that the gap between technology at a research level, and the technologies available to a designer who just wants to prototype something, is a challenge. I think educating people in a more holistic way, to produce artists with technical skills and engineers who are artistic, can help abate this problem we have of knowledge becoming so siloed, and allow for collaboration to occur more easily. Because I’m an artist, I haven’t had to deal too much with the challenges many women face in tech spaces. My challenge is more so trying to explain what I’m doing and why. There are a lot of artists who produce and work with technology, but many people are still unfamiliar with these practices and how they can contribute to a larger culture around tech design. Why is the #WomenInTech movement important to you? One of the reasons why I make things that are deliberately “out-there,” and strange, is because I’m trying to point to the fact that there’s a really wide range of possibilities for how the future can look. I want to see more of those possibilities, and the only way we can see a greater diversity of ideas within tech design is to see more diversity among our designers… aka more #WomenInTech as well as more people from underrepresented groups in general. What is the most important piece of advice you can give to all of the female founders and entrepreneurs out there? You know more than you think you do. Because I don’t have formal engineering training I was initially insecure about my prototyping knowledge. It took a couple experiences of asking people who I perceived to be more well-versed in it for advice, to find out that no one knows everything. There’s just too much to know out there! And that’s ok. You most certainly know a lot about whatever it is you’re interested in and care about, don’t let insecurity or imposter-syndrome stop you from presenting yourself as the expert that you are. What will be the key trends in the fashion tech/smart textiles industry in the next 5 years and where do you see it heading? Wearable tech that relates to sustainability will be a big trend I think. On the production side of fashion, that means using more sustainable materials and production practices, but it also may mean re-thinking our relationship to fashion altogether. I’ve seen suggestions for creating clothing that changes shape and design, so you never need to replace it, effectively ending “fast fashion.” We may also see wearables designed to harness your body’s kinetic and heat energy as a sustainable power supply, and wearables that keep you more in tune with your environmental surroundings through feedback and data. Another area where we will see a lot of change and growth is in assistive tech. We are in an era in which people are really educating themselves and others to eliminate stigmas associated with disability. This will almost certainly have ramifications on assistive tech design, which may go from solely utilitarian, to still utilitarian but also expressive, celebratory, and individualized. I am a big admirer of Suzanne Lee and her research on growing sustainable “bioleather” from organic materials with the company Modern Meadows. She has this industry side of her practice but she also has an experimental arts and design background that I think helped her arrive to where she is now. Kate Hartman, a fellow artist who also works with wearable technology and humor, she’s specifically interested in exploring communication through wearables and she runs a lab up at OCAD University in Toronto called The Social Body Lab. Lucy Orta, a designer who created a series in the 90s called “Refuge Wear,” which explored how wearable objects could transform into shelter. Her work shows how conceptual design work can help promote critical conversations. For more references on artists working with wearables I highly recommend the book “Garments of Paradise,” by Susan Elizabeth Ryan, there are a ton of inspiring pieces in there. This interview was conducted by Amanda McIntyre-Chavis, Women of Wearables Ambassador in New York, USA. She is the CEO and Founder of LegendFactory, a interactive brand management company and two new tech initiatives: Muzaik, a social media aggregator and Myndfull, a wearable tech company. She is also an active mentor, arts advocate and supporter of various social causes. Based in New York, Amanda is a member of the National Academy of Recording Arts & Sciences, Inc. (NARAS), the National Association of Black Female Executives in Music & Entertainment (NABFEME), National Association of Professional Women (NAPW), the ELLEVATE Network and Women In Music. Follow her on Twitter @AmandaMcChavis.